We all felt that slight chill in the air this week, welcoming the transition from summer to fall. And, with such a welcome transition, comes the perfect time for change—whether it's switching out that iced latte for a streaming americano, or a new 'do. Aviary esthetician Kelly Painter welcomed the cool weather this week, warming up her summer look by adding bangs. Bangs have always been a surefire way to give your look a lift (literally), and Kelly's frame her face in just the right way. Jenni Snyder Renshaw, Aviary's newest stylist, recommends using Davines Relaxing Fluid on damp hair to tame side swept bangs. Blow dry with a vented or paddle brush in the opposite direction your fringe will lay. Then, spritz some Davines Invisible No Gas Spray on the brush, and smooth hair back in to place. We can't help but say bangs, not botox to lift you into fall. 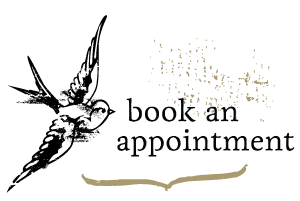 Schedule your next appointment here.